And finally…our Europe editor, Ian Traynor, has interviewed eurogroup president Jeroen Dijsselbloem about the state of the eurozone. It&apos;s not completely decided what that authority should look like. The main thing is it should be effective. You need to be able to decide overnight, over a weekend. The €60bn cap is mainly to give a signal that the direct recapitalisation is a means of last resort," said the Dutch minister. "Once again for too long we have been thinking public backstops are standing right in front … We want to change that. The €60bn is basically a political message saying it&apos;s going right to the end. Private means private investors. So resolution funds have to be used first. The €60bn is a political statement saying let&apos;s not start with the ESM." And that&apos;s a good moment to stop. Back tomorrow – until then, thanks and goodnight. Stock markets on both sides of the Atlantic sagged today, in a pretty uneventful session. China&apos;s surprise drop in imports and exports (see opening post) weighed on traders, while fears of political instability in Italy hit the Milan stock market. Investors were cautious ahead of the release of the minutes of the Federal Reserve&apos;s last monthly meeting, at 7pm BST. And then a speech from Fed chair Ben Bernanke at 9pm BST. On Wall Street, the Dow Jones index is down just 27 points, or 0.18%, at 15274. European markets spent most of the day trading on the back foot, pushed lower over concern about the latest deterioration in Chinese economic data which showed significant declines in both exports and imports for the month of June. Given that these figures came on the back of a blanket downgrade of growth forecasts by the IMF yesterday, the surprise weakness in the latest batch of Chinese data has reinforced negative perceptions about the possibility of a much sharper than anticipated Chinese slowdown. Elsewhere in Europe we’ve also seen further deterioration in economic data, from both France and Italy, as well as a downgrade from Standard and Poor’s for Italy with a negative outlook, due to weakening economic prospects and the country’s impaired banking system. There is also the added factor that investors lack the confidence to push this week’s gains much further ahead of the release of the latest FOMC minutes and Bernanke’s speech later tonight. A new conflict opened up between Brussels and the German government today after the European Commission proposed that it should be given the power to wind up failed lenders. Under the EC&apos;s proposal, presented this morning, it would control the "Single Resolution Mechanism”, which would give it the power to close down any of the eurozone&apos;s 6,400 financial institutions. It would be backed with €60bn, eventually, in cross-border funds. We have seen how the collapse of a major cross-border bank can lead to a complex and confusing situation,. Chancellor Angela Merkel of Germany has said a single authority requires a new EU treaty and on the eve of the announcement, Wolfgang Schäuble, her finance minister, warned Brussels to respect the limits of the law or “risk major turbulence”. France, Italy and Spain are more enthusiastic about rapid centralisation. Michel Barnier, the EU commissioner responsible for the reforms, said he had “listened carefully” to the legal concerns but was convinced action was necessary possible without delay. 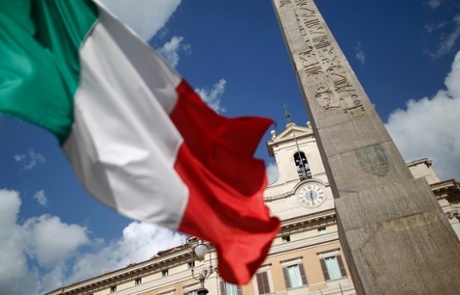 Analysts at Société Générale also fear that the situation in Italy could unravel. Italian journalist Fab Goria tweets the key points from their latest note. 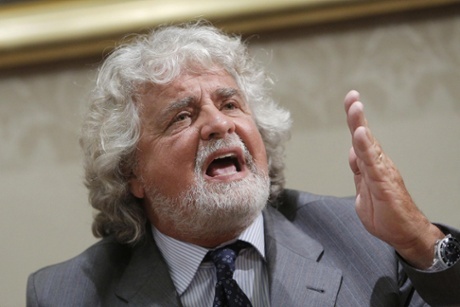 Beppe Grillo, the radical leader of Italy&apos;s Five Star movement which won strong support in spring&apos;s general election, has turned the political crisis dial up a notch. After meeting with president Georgio Napolitano today, Grillo declared that italy was heading for a catastrophe. He said he&apos;d recommended that another election is called unless Enrico Letta&apos;s government gets to grips with the economic downturn quickly. I thanked Napolitano for his…concern and I expressed my concern for the state of the economic, social and political life of the country. I told the president that he has taken a…huge responsibility, and I asked him to go to the polls if necessary. Grillo was speaking as Enrico Letta&apos;s government was buffetted by the walkout called by Silvio Berlusconi&apos;s PDL group, in protest at his final appeal being brought forward. The Five Star leader took the opportunity to tell reporters that the government should cut spending on military projects, and spends more on benefits for pensioners. He also said Italy, whose GDP is expected to fall by 1.8% this year, was in the equivalent of a &apos;war economy&apos; and needed urgent measures. So, Italy is on the brink of a full collapse. Good to know. The parliamentary leaders of Silvio Berlusconi&apos;s party have demanded the suspension of parliament in protest at a decision by the supreme court aimed at preventing him from evading a four-year jail sentence on a technicality. The heads of the media tycoon&apos;s Freedom People (PdL) movement in both chambers said they wanted the legislature to cease all activity for three days. The centre-left Democratic Party (PD), which is joined to the PdL in Italy&apos;s left-right coalition, immediately rejected the demand, opening a rift within Enrico Letta&apos;s already fragile government. Italy&apos;s highest criminal court has defended its decision to fast-track Silvio Berlusconi&apos;s final appeal in the long-running Mediaset tax fraud trial, amid growing political fallout over the decision. The Cassation judges said they had followed normal procedures by scheduling the heading on 30 July, earlier than expected, because the statute of limitations on one of the charges expired on 1 August. Berlusconi was sentenced to a four-year prison term and five-year ban from holding public office, and while the jail term could be set aside the former PM faces being thrown out of parliament. Members of Berlusconi&apos;s People of Freedom (PDL) party are now boycotting a government summit today, and Reuters reckons that "almost all activity" in both houses of parliament has been suspended. 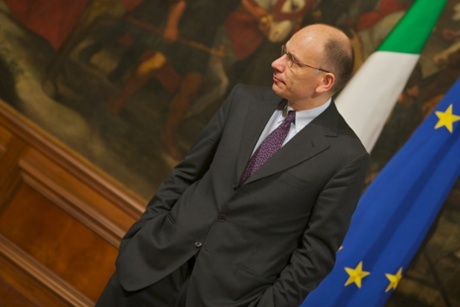 PDL are one of two main partners in Enrico Letta&apos;s fragile coalition government. Today&apos;s walkout adds to concerns, flagged up by John Hooper this morning, that the government&apos;s future is at risk. Keep Talking Greece reports that next week&apos;s Greek general strike, on 16 July, will include a protest march starting at 12.30pm local time (see 12.05pm for earlier details). It adds that civil servants will down tools at noon tomorrow, and hold a protest in Klafthmonos square in downtown Athens. Portugal&apos;s president will speak to the nation tonight following days of talks with its political leaders, after the (temporary) resignation of junior coalition leader Paulo Portas prompted a short-term panic. #Portugal. President Cavaco Silva to address the country at 20h30 after consultations on survival of government coalition. With Portas back in the fold (promoted to deputy PM and preaching unity and stability), and Portuguese borrowing costs lower (10-year bonds are yielding 6.8% this afternoon, down from the 8% hit last week), the crisis may have abated…. Open Europe have published a blogpost on the news that Silvio Berlusconi&apos;s final appeal in the Mediaset tax fraud trial will take place on 30th July. Berlusconi&apos;s party wants to suspend all parliamentary activities for three days in protest against the Supreme Court&apos;s decision, or it will pull out of the coalition- which would deprive Enrico Letta&apos;s government of its majority in parliament and potentially make snap elections a real prospect. The impression is that, even if this immediate threat were turned down, the survival of the Italian government may be put in doubt again shortly should the Supreme Court uphold the five-year public office ban for Berlusconi – making it definitive and effective. More here: Is Italy already heading for fresh political uncertainty? Opposition to Greece&apos;s financial programme continues to build, with unions calling a new 24-hour general strike next week and protests continuing today. GSEE, the main private sector union, has announced a one-day walkout on July 16th, next Tuesday. It will be the first major protest since the Athens government reached an agreement with its lenders, unlocking its next aid payments with a promise to push on with public sector layoffs. GSEE said the planned job cuts were unfair, and hasn&apos;t given up hope of changing the course of the bailout. The government and the lenders need to finally realise that we are people – not numbers. Our fight will continue and it will intensify as long as those who take decisions insist on driving the people to poverty. 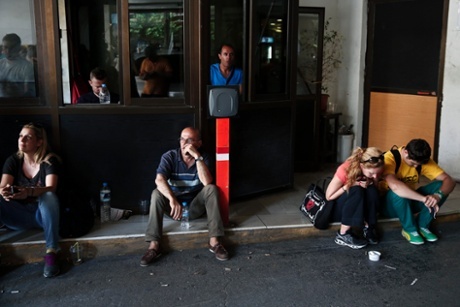 The Greek government tabled legislation last night to cut thousands of state sector jobs. MPs are expected to vote on it next week – potentially on the same day as the general strike. Athens municipal police, angered by their inclusion in a government plan to reduce the number of civil servants and meet international bailout requirements, have occupied a municipal building in downtown Athens. The main union for municipal workers, who have been on strike for the past two days, has called for building occupations on Wednesday and Thursday, and has extended rolling 24-hour strikes for the rest of the week. Can the strikes do any good? They could strengthen the resolve of MPs who want to oppose the legislation to implement Greece&apos;s next bout of austerity. The government still has a majority in parliament, although narrower since Democratic Left quit the coalition. So it may simply be symbolic. But with the Troika already worrying that Greece lacks political motivation to stick to the bailout (see 9.02am), the strike won&apos;t make lenders any less concerned. Dire industrial output data from Greece this morning, which dents any hopes that the country&apos;s recession might finally be easing. • Mining and quarrying production decreased by 19.6% (compared with May 2012). • Manufacturing production decreased by 1.8%. • Electricity production decreased by 10.3%. • Water supply production decreased by 1.2%. 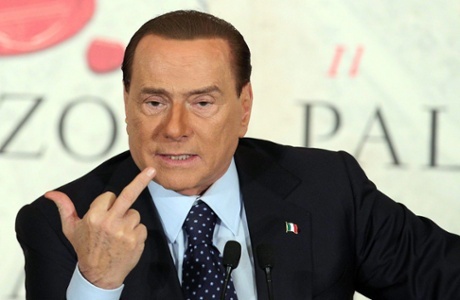 Political analysts Alberto Nardelli, and Vincenzo Scarpetta of the Open Europe thinktank, also agree that Silvio Berlusconi&apos;s court hearing at the end of this month is pretty significant…. #Italy: Final verdict on #Berlusconi's tax fraud trial due on 30 July (earlier than expected). Gov't at risk if public office ban is upheld. S&P’s downgrade came late in a day that also saw Italy’s supreme court decide that it would rule on July 30th on Silvio Berlusconi’s appeal against his conviction for tax fraud – much earlier than expected. Though his Bunga Bunga trial is the one that has – unsurprisingly – captured the media coverage, the tax dodging case is the one with the potential political punch. It was always known it would reach its climax first, and no one can predict how Berlusconi would react to a definitive conviction. One possibility open to him is to bring down Enrico Letta’s three-party, left-right coalition in the same way he scuppered Mario Monti’s non-party, technocratic government last year. If the case had been parked in the normal way for about six months, one of the counts on which he was charged would have been ‘timed out’ by a statute of limitations and the judges would probably have had to send the case back to a lower court. That in turn would have given more time for the other count to lapse. With the odds on an early election suddenly shorter – Corriere della Sera was speculating this morning it could be in October –Berlusconi’s followers in government will be less disposed to compromise on their demands. Chief among these is the fulfilment of their leader’s election pledge to abolish a property tax on first homes. So far, the debate on this has revolved around the effects on Italy’s public finances — it would not exactly enhance its chances of paying off its huge debts. But in its reasoning S&P highlighted another issue. Despite these problems, Italian government debt has only weakened slightly (see 8.18am). The Netherlands has followed France (see 8.08am) by reporting a drop in manufacturing output in May — it fell 0.6%, after a 0.6% rise in April. 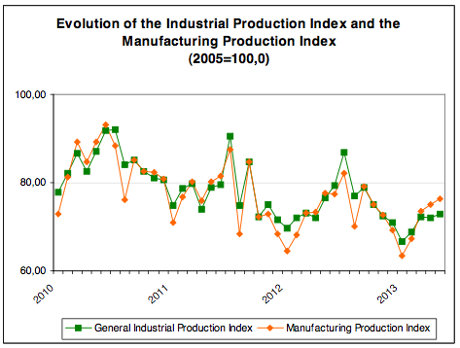 And Italy has reported a 0.1% rise in industrial production – the first increase in four months. Analysts had expected a stronger rise, though, of 0.3%. Put together, it suggests May wasn&apos;t a great month for many of eurozone&apos;s larger economies. 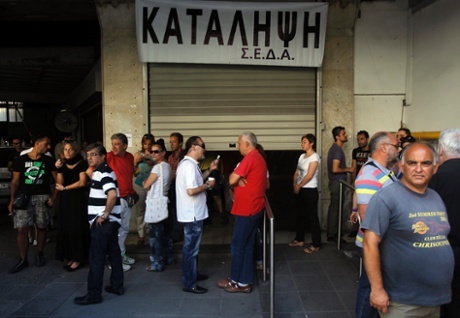 Speaking of Greece…. last night Reuters published extracts from the Troika&apos;s latest assessment of the Greek situation, and it&apos;s rather worrying. It appears Greece&apos;s lenders are losing confidence in the Athens government, despite finally agree to extend its next loan on Monday. The report questions Greece&apos;s "willingness and capacity" to collect taxes, and warns that officials identified "new shortfalls" in Greece&apos;s fiscal plans. That implies further austerity measures could be needed, on top of what&apos;s already been agreed. The strengthening of the tax administration constitutes a key pillar of the fiscal consolidation strategy…Failure to deliver the targeted improvement in collection performance would imply the need to seek alternative measures to close the emerging fiscal gap. Over in Greece, some municipal staff are continuing to protest against the Greek government&apos;s plan to trim its public sector workforce. Downgrade mostly priced in? 10yr BTP (4.44%) now just 5bps from yesterday close, with auctions today and tomorrow. Italy appears to be largely shrugging off last night&apos;s credit rating downgrade from Standard & Poors. Italian sovereign debt has weakened a little this morning, pushing up the yield on its 10-year bonds to 4.45%, from 4.39% yesterday afternoon. That&apos;s a fairly soft reaction, though. A year or two ago, a one-notch downgrade would probably have spooked bond investors rather more. The Italian stock market, the FTSE MIB, has dropped by around 0.5% in early trading, led by its banks (who can expect their own ratings to be lowered by S&P). Unicredit down 1% – thats not that much given the downgrade – but we will see. S&P blamed the worsening Italian economic outlook for its decision to cut Italy&apos;s rating to BBB, from BBB+. It expects GDP to fall by 1.9% this year, even worse than the IMF&apos;s new forecast of a 1.8% contraction. Just in – confirmation that France&apos;s manufacturing sector continued to struggle in May. Industrial output in Europe&apos;s second-largest economy fell by 0.4% month-on-month, driven by a 1.1% drop in manufacturing output. Output went down in other manufacturing (-2.4%), in the manufacture of food products and beverages (-2.3%), in the manufacture of electrical and electronic equipment and machine equipment (-1.1%) and in the manufacture of transport equipment (-1.4%). On the opposite, manufacturing output bounced by 13.9% in the manufacture of coke and refined petroleum products. The 0.4% drop in industrial output is actually better than analysts had expected (a 0.8% fall was pencilled in), but it won&apos;t help France climb out of recession. Here&apos;s INSEE&apos;s full statement. Good morning, and welcome to our rolling coverage of the latest events across the eurozone, the world economy and the financial markets. Europe is waking up to new fears of a global slowdown after disappointing economic data from China overnight. 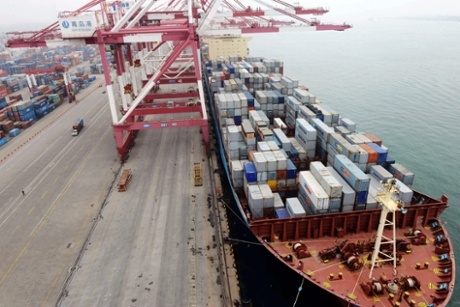 China suffered a 3.1% drop in exports in June, the first time exports had shrunk since the start of 2012, and the biggest monthly fall since October 2009. Imports shrank by 0.7% for the second month in a row, alarming economists who expected both imports and exports to rise. And Customs spokesman Zheng Yuesheng did little to calm nerves, telling reporters in Beijing that China faced a &apos;grim&apos; outlook. "Prolonged slugging foreign demand" was hurting exporters, he said – a nod to the long downturn in the eurozone. Currently, China&apos;s foreign trade is facing grave challenges. Some analysts are suggesting that we&apos;re now getting the true picture of the Chinese economy, after officials clamped down on a scam where firms would invent export sales as a way of sneaking capital into the country (here&apos;s a good explanation of the practive on the Financial Times). The trade figures are causing concern in Europe and Asia — a day after the International Monetary Fund trimmed its growth forecasts for both China and the eurozone (details here), and warned that emerging markets are facing tougher times. Worst y/y Chinese export figs the data-highlight overnight. Poor imports to far behind. IMF update y'day looked complacent on China. Markets looking at the true face of the Chinese economy today and shouting "Argh! Turn the lights back off." A weakening Chinese economy is a blow to the eurozone&apos;s efforts to drag itself back to growth (as well as being partly triggered by weak demand in Europe). The downside risks to the 2013 GDP forecast are increasing. Gloom abounds. We get new industrial production data from France and Italy this morning, which will show how two of the eurozone&apos;s larger members are faring. I&apos;ll also be monitoring reaction to last night&apos;s one-notch downgrade of Italy by Standard & Poors, and fresh corruption allegations in Spain, along with all the main action through the day….